Overuse of mobile phones and headphones and exposure to increasing noise pollution, particularly in urban areas, are causing hearing impairment of a large number of people in the country every year. 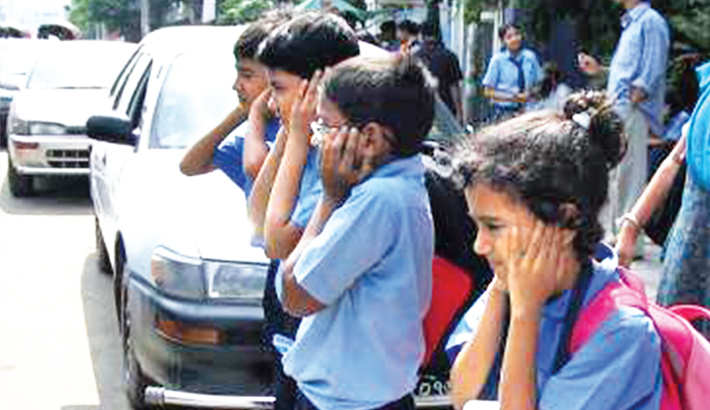 According to experts, loudspeakers used for various reasons and the hydraulic horns honked by vehicles are the main source of noise pollution in Bangladesh. Health experts say noise pollution causes not only hearing loss, but also hypertension, high level of stress and other harmful effects. Around 11.7 percent of Bangladesh population are suffering from hearing difficulty due to pollution, according to a study conducted by the Department of Environment (DoE) in 2017. Over one billion young people, aged 12-35 years, risk irreversible hearing loss due to exposure to loud sounds such as music played on their smartphone, according to World Health Organization (WHO). WHO data show that around 50 percent of young people are exposed to an unsafe level of sound through personal audio devices including smartphones, whose use continues to grow globally. According to the UN agency, more than one in 20 people or 432 million adults and 34 million children have hearing difficulty. Most sufferers live in poor and middle-income countries, WHO notes, adding that by 2050, more than 900 million people will have significantly impaired hearing. Around half of all cases of hearing loss could be prevented through public health measures, according to WHO. “At the moment, we don’t really have anything solid other than our instinct to tell us—are we doing this right, or is this something that is going to lead to tinnitus and hearing loss a few years down the line?” she said. On March 3, WHO launched a new mobile and web-based app called “hearWHO,” which allows people to check their hearing regularly, and intervene early in case of hearing loss. “Once lost, hearing does not come back. Through World Hearing Day, and with the support of this app, we encourage people to ‘Check your hearing!’ in order to help preserve this valuable gift that helps us enjoy life,” Dr Shelly Chadha said. A parental volume control option is also included in the UN recommendations to industry, which participated in two years of discussions along with experts from government, consumer bodies and civil society. Dr Kanu Lal Saha, associate professor of ENT and Head Neck Surgery Department of Bangabandhu Sheikh Mujib Medical University (BSMMU), told daily sun deafness and hearing problems occurred due to various reasons. Among them, loud sound hits the ear anyway are one of the major reasons. He said currently technology is adding to noise pollution; for example, listening to music with headphones at high volume, long-term contact with cell phones, smartphones, loudspeakers and audio devices or mp3 player, etc. Community noise, hydraulic horn and nose from factories are contributing to noise pollution. “Staying in the noise polluted area is very harmful, such as hydraulic horn on the road, high sound in garment, shooting, rail or cargo vehicle. Noise pollution can cause hypertension, high stress levels, and other harmful effects,” he added. People may lose their hearing ability if loud music is played through audio devices, smartphones or in music concert,” he added. The health official suggested proper medical examination through necessary testing if hearing problem arises. Because, hearing loss could be prevented through proper treatment, added the doctor.